When it comes to your home oral health habits, you may regard flossing as an optional addition to brushing. While flossing is an addition to brushing — as in both cleaning methods are complementary — it is something that is not necessarily an option. In fact, many dentists would recommend that you floss your teeth daily, in addition to brushing twice daily of course. Taking your time to carefully floss between each of your teeth is a key factor in your dental health. In today’s post, we will share some of the benefits of flossing every day. The best thing about flossing daily is that you’re able to clean where brushing just can’t reach, and that’s in between your teeth. If you don’t properly clean between your teeth, you’re risking bacteria and plaque buildup, which can potentially lead to a wide range of dental problems. Food debris trapped in between teeth and in the gum line may contain bacteria that cause foul-smelling breath. Daily flossing can help to eliminate smelly odors from your mouth while keeping your breath fresh and teeth free from unsightly food particles. It doesn’t take long for plaque to accumulate on your teeth. When plaque begins to build up, it can cause your teeth to become yellow. Daily flossing will help to remove plaque from between your teeth, helping keep them clean and white. Many people may not realize that when you floss every day, you’re protecting your gums. Food particles can get stuck right where the gums and teeth meet, and this is where flossing comes in handy. As mentioned, flossing cleans better in between teeth than brushing, so make sure to floss either right before or right after brushing your teeth. Has flossing caused you to bleed? This usually happens when you’ve gone a while without using dental floss. Those who floss regularly are less likely to bleed the times that they do floss. Many people who experience painful brushing are scared to floss. However, pushing through a couple of uncomfortable weeks with regular flossing can remove the bacteria that is causing sensitivity and inflammation in your gums. Once you are back on track, you will experience less pain! As you can see, there are a variety of benefits of using dental floss daily, which is why is an important part of preventative dental care! 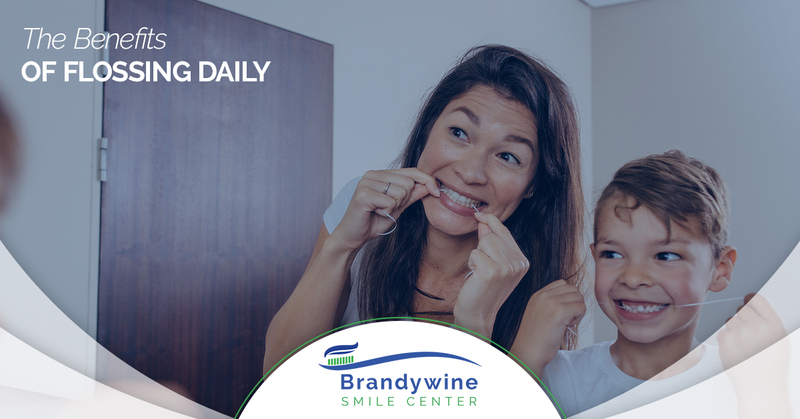 At Brandywine Smile Center, we offer a range of preventative dental care services to help you maintain good oral health. To learn more, contact our Glen Mills dental office today!